I haven't taken a picture of any of my new deliveries in ages. It's time for a catch-up to distract me from the disappointment that the new Sumeragi video hasn't gone online yet (hehe). 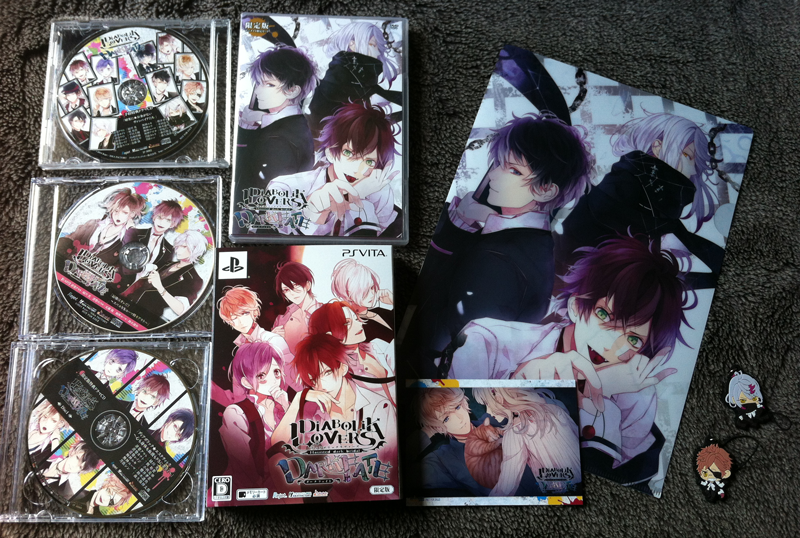 First up is Diabolik Lovers Dark Fate for PlayStation Vita. I preordered the Animate pack which meant I received the special edition version of the game, the new exclusive anime episode on DVD, a large clear file, rubber straps of Carla and Shin, a bromide and four exclusive drama CDs (one's a double pack). That's a lot of extras for a single game purchase! Moving on, I picked up the latest issues of Animedia Deluxe and Dengeki Maoh for their Sengoku Basara content. Animedia Deluxe wasn't a good buy as I already had all of the Judge End illustrations from previous magazines, but Dengeki Maoh had a column written by YamamotoD that I want to translate. Expect it to appear here in the next couple of weeks when the previous issue has also been delivered. The latest Gakuen Basara arrived too so I'm looking forward to reading it soon. 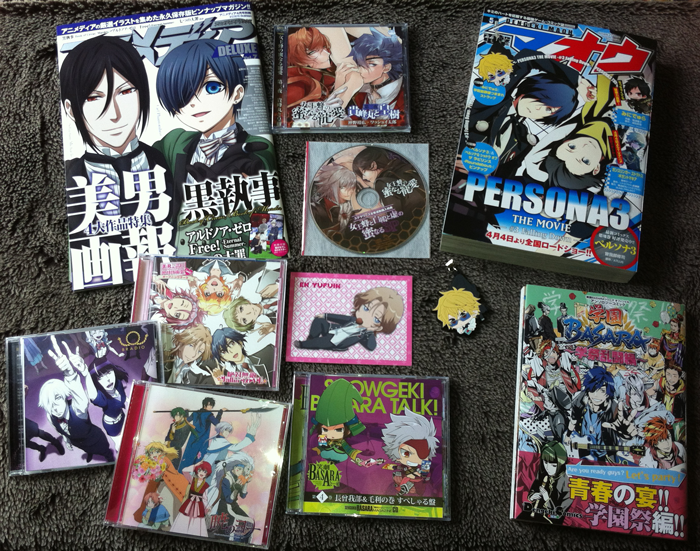 The books are accompanied by CDs with the opening themes for Akatsuki No Yona, Death Parade and Binan Koukou Chikyuu Boueibu LOVE! as well as Showgeki Basara Talk! Chousokabe & Mouri No Maki Special-ban and the final Jooubachi No Mitsunaru Chouai CD, which included a bonus disc for buying all three episodes from Stellaworth. The Boueibu CD came with a character card (mine was Yufuin En) and Dengeki Maoh included a bonus rubber strap of Heiwajima Shizuo from the MiniDura manga. 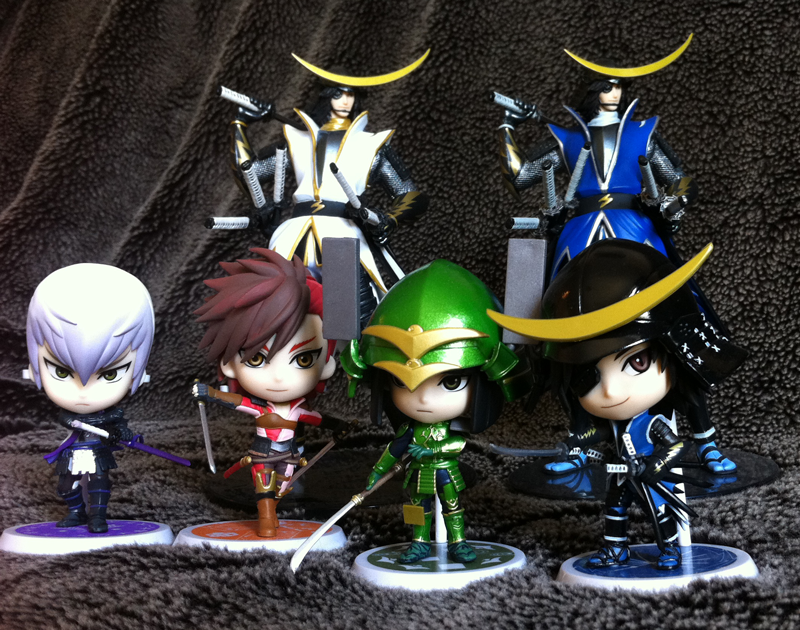 The last set of goodies are the six prize figures from this year's Ichiban Kuji Sengoku Basara ~Sengoku Sousei~ lottery which I bought from resellers since you can't enter the draw from overseas. 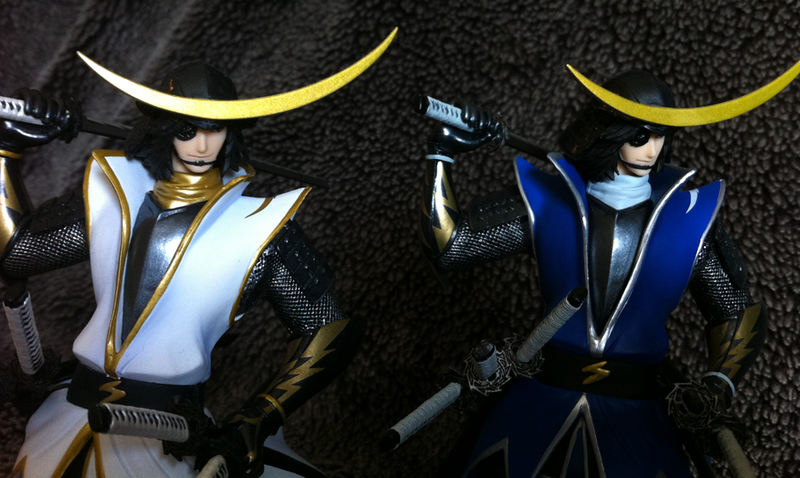 A slightly closer view of the two 'real figure' Masamune prizes. I like them both. It's not shown in the pictures but the stands have his Giga Basara dragon on them - the dragon is black on a transparent grey background for the regular version, and gold on black for the white figure. 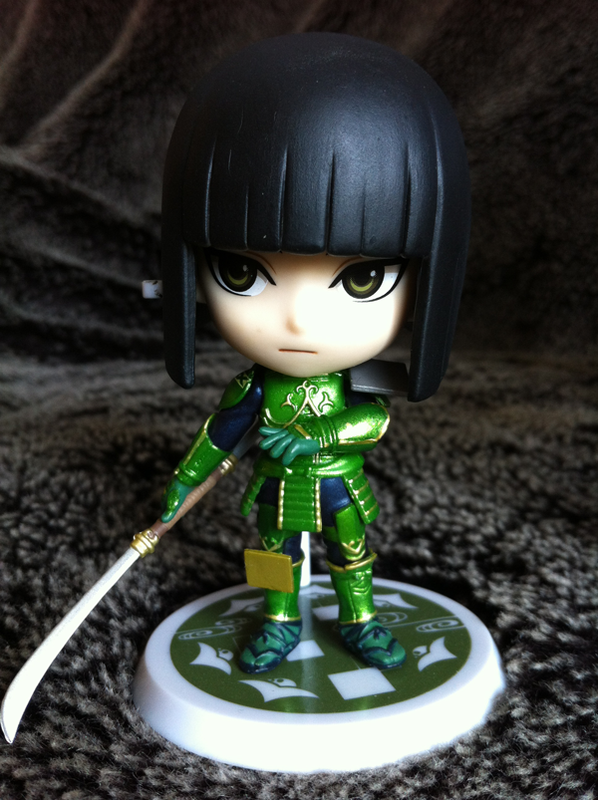 As much as I love the others, I think my favourite is actually the Katsuie figure. You can remove his helmet and they've used a sparkly metallic green paint for the armour (like the special 'Last One' prize versions of Masamune, Yukimura, Mitsunari and Sakon). So cute! I just realized that the BSR chibi figs here look incredibly similar to some Naruto figures I got which were also described as "Last One" or something similar. The line of figures is called the 'kyun-chara' set (I think they're trying to appeal to the same people who collect the similar-looking Nendoroid figures from other series). I have a couple of other similar figures too so they should be the same scale as your Naruto set! Ahhh Kyun-chara! Yep, that looks like it's the one I was thinking of, thank you! I always find it neat when figures carry a certain "art style" across its entire line so that's great!